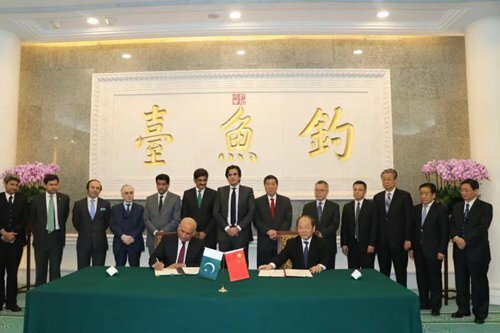 Makhdum Khusro Bakhtyar (left) Pakistan's Federal Minister for PD&R and Ning Jizhe (right), Chinese Vice Chairman of NDRC sign the MoU on industrial cooperation during the meeting at the Diaoyutai State Guesthouse on Thursday. The 8th meeting of the Join Cooperation Committee (JCC) on China-Pakistan Economic Corridor (CPEC) was held in Beijing on Thursday, co-chaired by Pakistan's Federal Minister for Planning Development & Reform (PD&R) Makhdum Khusro Bakhtyar and Chinese Vice Chairman of National Development Reform Commission (NDRC) Ning Jizhe. Chief Minister of Sindh Murad Ali Shah, Chairman Board of Investment Haroon Sharif, and representatives of provincial governments and officials of both sides attended the meeting. "The stage is now set to take it to the next level where in the cooperation can be diversified to more trade and industrial cooperation, socioeconomic development, agricultural development, people-to-people interaction and knowledge sharing under the clear vision set by our leadership," said Bakhtyar. Highlights of the JCC included a conclusion of a memorandum of understanding (MoU) on industrial cooperation and establishing a cooperation framework on socioeconomic development. In his remarks, Ning said that CPEC serves the fundamental interests of the two countries and their people.